Must a Poem be a Perfect Unity? HAZARD ADAMS is Professor of English and Comparative Literature at the University of Washington. With Leroy Searle he has recently edited Critical Theory Since 1965 (Florida State University Press). DETLEF W. DÖRRBECKER currently teaches the histories of seventeenth-century Franco-Roman landscape painting and of American abstract expressionism at the University of Trier. 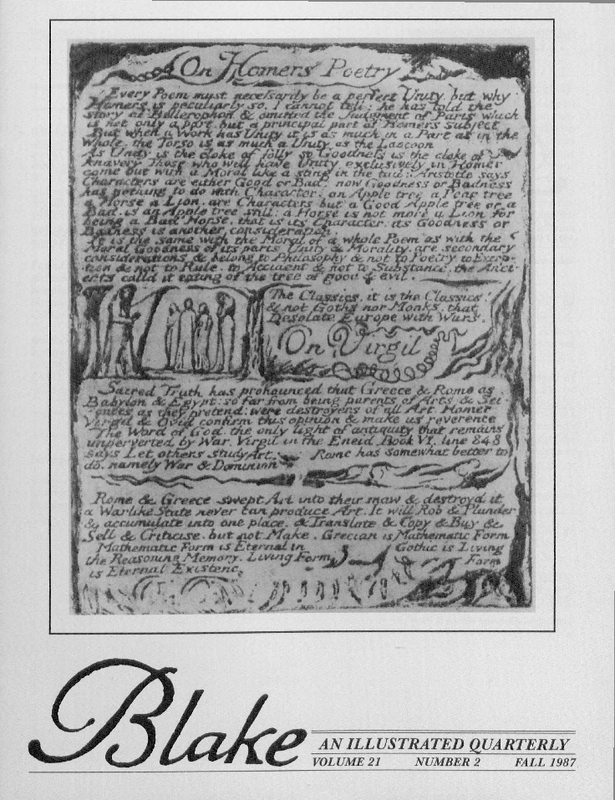 His book on Flache, Linie Figur und Raum: Grundzüge der Bildform bei William Blake is forthcoming. CATHERINE HAIGNEY is a doctoral candidate at the University of Virginia and a lecturer in English at Vanderbilt University. She is writing a dissertation on Chaucerian dream vision. ANDREW LINCOLN teaches English at Westfield College, University of London. He is currently preparing a commentary on The Four Zoas. COVER: On Homers Poetry by William Blake, courtesy of the Watkinson Library, Trinity College, Hartford, CT 06106. Production Office: Morris Eaves, Department of English, University of Rochester, Rochester, NY 14627, Telephone 716/275-3820. Blake / An Illustrated Quarterly is published under the sponsorship of the Department of English, University of Rochester. Subscriptions are $18 for institutions, $15 for individuals. All subscriptions are by the volume (1 year, 4 issues) and begin with the summer issue. Subscription payments received after the summer issue will be applied to the 4 issues of the current volume. Foreign addresses (except Canada and Mexico) require a $3 per volume postal surcharge for surface mail, a $10 per volume surcharge for air mail delivery. U.S. currency or international money order necessary. Make checks payable to Blake / An Illustrated Quarterly. Address all subscription orders and related communications to Patricia Neill, Blake, Department of English, University of Rochester, Rochester, NY 14627, USA. Manuscripts are welcome. Send two copies, typed and documented according to the forms suggested in the MLA Style Sheet, 2nd ed., to either of the editors: Morris Eaves, Dept. of English, University of Rochester, Rochester, NY 14627; Morton D. Paley, Dept. of English, University of California, Berkeley, CA 94720.
International Standard Serial Number: 0006-453x. Blake / An Illustrated Quarterly is indexed in the Modern Language Association’s International Bibliography, the Modern Humanities Research Association’s Annual Bibliography of English Language and Literature, English Language Notes’ annual Romantic Bibliography, American Humanities Index, the Arts and Humanities Citation Index, and Current Contents.